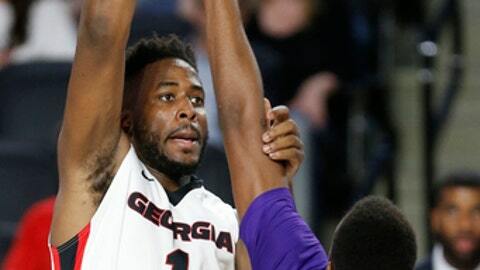 ATHENS, Ga. (AP) Yante Maten puts a lot of stock in moving into second place on Georgia’s career scoring list. Maten had 27 points and 11 rebounds, freshman Rayshaun Hammonds scored a career-high 21 and Georgia beat LSU 93-82 on Saturday. Juwan Parker added 15 points as the Bulldogs (16-12, 7-9 Southeastern Conference) overcame an abysmal 3-point performance in the first half by dominating the boards and forcing LSU to lean too much on its guards to score from the perimeter. Freshman Tremont Waters finished with 25 points and Skylar Mays added 20 for LSU (16-12, 7-9). The Tigers have lost six straight SEC road games. Maten, with 1,797 career points, passed Alec Kessler and Vern Fleming to take the second spot on Georgia’s career scoring list. He also moved past Charles Claxton for the fifth spot in rebounding. Georgia, with a season high in points, has won three of four entering the last week of the regular season, but the Bulldogs showed why they’ve been so fickle this year, leading by 22 early in the second half before falling flat offensively and letting LSU pull within single digits in the closing minute. Georgia missed 14 of 16 attempts beyond the arc in the first half, but kept possessions alive with 12 offensive rebounds. Derek Ogbeide put an accent on the effort at the buzzer, his one-handed putback giving the Bulldogs an 11-point lead after Turtle Jackson missed for the fourth time. The lead swelled to 19 in the first two minutes of the second half as Maten hit a jumper and grabbed a defensive rebound while falling out of bounds. He fed the ball to Jackson, who quickly assisted on Teshaun Hightower’s 3. Maten, the SEC’s leading scorer and third-leading rebounder, had his way with LSU for the second time this season. The senior forward scored 21 points and hit the game-winning basket with five seconds to go at Baton Rouge. The Tigers had no means of containing him this time either, getting out-rebounded 49-34. LSU: It was all about problems inside as big men Duop Reath, Wayde Sims and Aaron Epps combined for just 10 points and 11 rebounds. Maten, Ogbeide and Nicolas Claxton pushed them around in the paint all afternoon and the Tigers didn’t respond. Despite the overall progress it’s made this season, LSU needs its front line to step up consistently. With Reath nursing a sore ankle and playing only nine minutes earlier this week against Vanderbilt, Sims started in Reath’s spot and combined with Aaron Epps for seven dunks and 31 points – but they had nine between them this time. Georgia: Litterial Green is the Bulldogs’ career scoring leader at 2,111. … Playing one of their most complete games of the season, the Bulldogs looked like the team that earlier this month won in overtime at Florida and upset Tennessee at home, but they gave away momentum with a loss earlier this week at South Carolina. Georgia is still hard to read, its outcomes dependent on whether Maten has to do all the heavy lifting on offense. That wasn’t the case this time. LSU: Visits South Carolina on Wednesday and closes the regular season next Saturday at home against Mississippi State. Georgia: Hosts Texas A&M on Wednesday and closes the regular season next Saturday at Tennessee.